February 25, 2011 Dan O. Sorry that it took so long, but I have finally watched all of the Best Picture nominees for this year! Resilient teen Ree Dolly (Jennifer Lawrence) goes on the trail of her missing, drug-dealing father when his absence jeopardizes the family’s safety. Her deadbeat dad has a key court date pending, and Ree is determined that he show up — despite the objections of the insular Dolly clan. It took me so long to finally get down to watching all of the Best Picture nominees of this year, and I must say it’s been pretty impressive overall. Except it’s a shame that this is my least favorite of the 10. 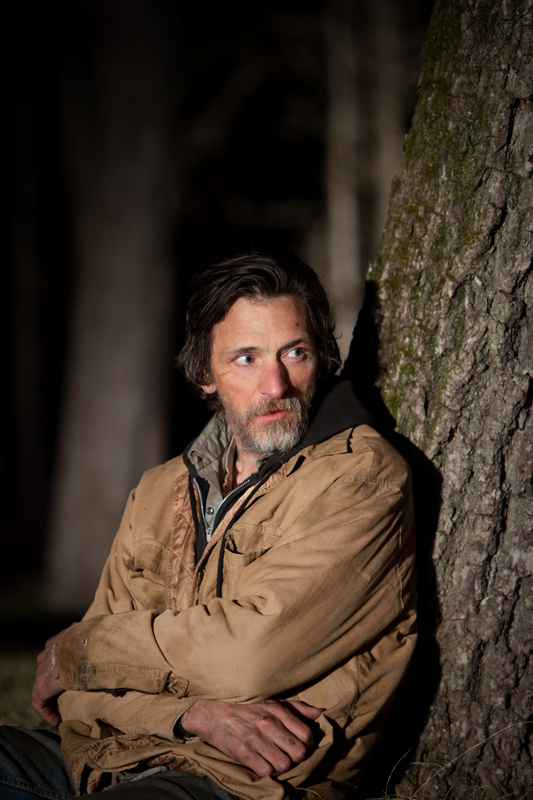 The film does a good job of capturing the look and feel of impoverished life in the Ozarks. It’s cruel, dirty, and almost everyone who inhabits it, has to fend for their own lives and learn how to survive. I liked how the film captured this perfectly, because it seemed like this setting set the tone for the bleak feel of the film, and that’s the part that actually worked. The problem with that bleak tone, is that the story itself isn’t that compelling. I was following this movie for it’s main mystery, but the slow movement of this film is just what made me lose my interest. The film just kept moving at a snail-pace right along, and it took almost 10 minutes each to get to every little or big plot twist that happened, and by the time something big and crazy happened, I really didn’t care that much. I thought the way that the film portrayed these Ozark white trash, and how mean and villainous they were, I surely though that this film was going to go somewhere very interesting, but instead it just kind of lags along. Certain scenes did work for me, but others were just sort of bland and really didn’t do much for me. Jennifer Lawrence stars as Ree, and does a very strong job here. She’s got that subtle “tough” presence that actually does make you feel more for her character, and actually have us behind her back throughout the whole film. She does a great job of actually carrying this film, and I think she’s going to be a face to watch in upcoming films. John Hawkes is great as Teardrop, because right from the moment you see him, you have a feeling your just going to hate the hell out of this guy, but Hawkes does a good job of controlling this character well. He’s both menacing and endearing, and yet you love him but you never know if you can trust him, and Hawkes brings out some of the best scenes here. There’s also a lot of little unknowns that show up in this film, and they all do fine with their material. 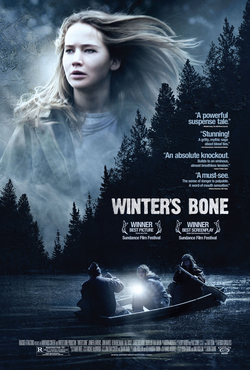 Consensus: Winter’s Bone has that menacing and dark tone, as well as some great performances from Hawkes and Lawrence that works for it, but the problematic story, slow pace, and overall just bleak outlook on everything, had me wanting more. Looks like I liked this one more than you did, Dan. I’m usually partial to seeing an Indie get its due amongst the heavyweights. What’s your Best Picture choice? It’s good, but not my favorite out of the the 10. I would like to see Toy Story 3 win it, but The King’s Speech I could see winning sadly. Really don’t want to see “The King’s Speech” win Best Picture…Best Actor definitely, wish Rush would get Best Supporting…but please no Best Picture. I’m with you on that one man! Anyway, I have already seen 7 of the BP nominees and I still want TSN to win BP. Sadly, it looks like there will be a split – BP (TKS), Director (TSN). But I’m still hoping with my fingers crossed! This was OK, and I hope so too. I don’t think that The King’s Speech was actually that good as everybody gave it, but I just hope Social Network gets some. This has a couple great performances but the movie itself was a bit too bland for too many stretches. 7/10 sounds about right for me. It does stretch way too far fr this material. I think it’s one of the year’s best, top 15. The tone felt real for me. If anything, I think Dale Dickey stood out more than Jennifer Lawrence. I tried reading the book. Slightly funnier and there’s a lot more background info for the characters. I guess the reason why I like the film is because it’s a window to characters I’ve never seen before.